This was Kryptonite’s problem. The bike locks retailed for $29.95 and came with a $1,000 money back guarantee if the lock was broken and the owner’s bike was stolen. In New York City, bike thieves had discovered a way to break the locks using Freon gas. Every day, more and more locks were being broken and Kryptonite was forced to pay $1,000 for each bike. They had to withdraw their $1,000 guarantee from New York. News of the Kryptonite’s guarantee withdrawal was picked up by national press. The brothers thought their business was doomed. However, they quickly refashioned their locks to eliminate the Freon problem and asked The Melton Agency to launch their new and improved product. Recommending that they face the situation head on, The Melton Agency recommended naming the new lock The New York Lock. 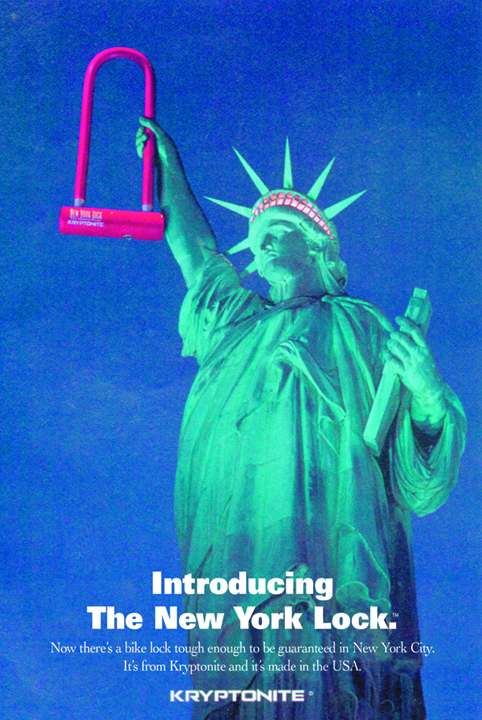 The agency created a simple, powerful image of the Statue of Liberty holding the New York Lock launched the campaign with full page newspaper ads, poster, mailers and point of sale material. The New York Lock became the most successful new product launch in the history of Kryptonite. A few years later, the brothers sold Kryptonite to a foreign investor for many millions of dollars.